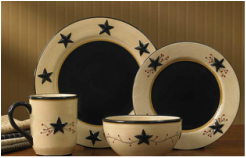 A fantastic look, Star Vine is hand painted and combines a sponged ground with embossed star and vine details to create a classic. 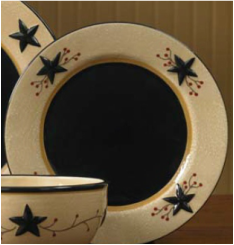 The Star Vine Dinnerware Collection features a black star and red berry vine pattern on a creamy tan background. 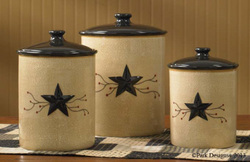 The Star Vine Pottery is perfect for your Country Primitive Home! 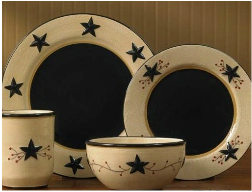 Made of quality high fire dolemite, ceramics are dishwasher and microwave safe. 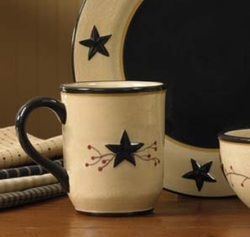 Each mug measures 4.5" x 3.75" holds 12oz., and comes as a set of 4 Mugs.